In case you missed it (and if you did, seriously get out from under that rock my friend), a new football league called the Alliance of American Football kicked off (well actually, they just started off – no kickoffs, but more on that later). There are 8 teams and they’ll each play a 10 game schedule. 4 games per weekend and everyone is in action each week. Saturday night brought us the return of the Head Ball Coach to the Sidelines when his Orlando Apollos took on the Atlanta Legends. We also saw the San Antonio Commanders host the San Diego Fleet on Saturday evening. 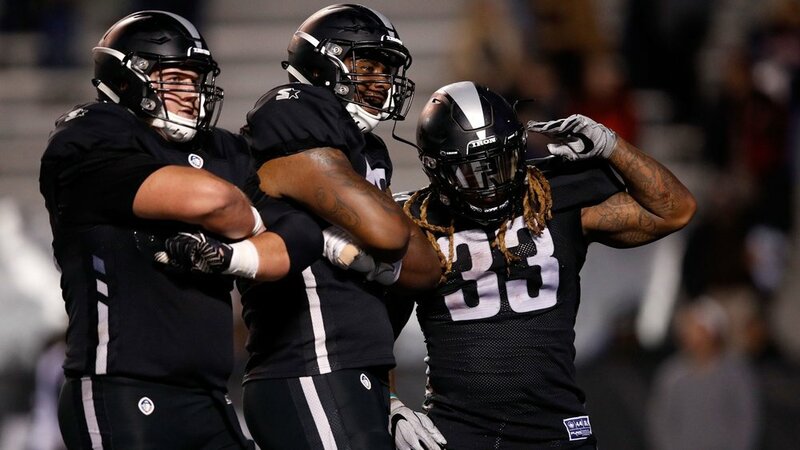 Sunday brought us two more games when the Birmingham Iron hosted the Memphis Express in the mid-afternoon, and the Arizona Hotshots and Salt Lake City Stallions closed out the weekend strong on Sunday night. A few quick notes on the league; first off, this is not the NFL so go ahead and cement that in your brain early on. Too many people were complaining online about the level of play week one - they need to take a step back and realize what this is. This is a start-up league in its first week of play consisting of former NFL players doing whatever it takes to get back to the league. It was never going to be Chiefs-Rams 2.0, and it’s not going to be going forward. The sooner people accept that, the more this league can grow with a wider audience. For the most part, the football was actually really good. Offenses are always going to start out slow, as you usually see in the NFL and in College, too. For the most part, this is a very similar game to what you’ll watch on Saturdays and Sundays in the fall. One noticeable difference is there are not kick-offs or extra points. Which if you ask me, is an improvement. I do agree that there is very little in the sport more exciting than a kickoff return for a touchdown, but with the emphasis of player safety on kickoffs it’s become so rare that replacing the kick-off with the “receiving team” starting off with the ball at the 25 won’t make a difference at all. Another thing the league is trying to emphasize is pace of play (Hello, Baseball). The league plans to get all games done in two and a half hours or less. They know that NFL and College Football games can quickly drag on for three and a half to four hours so they want to get you in and out in a reasonable time. Less TV timeouts are better for everyone involved, if you ask me. Finally, what might be my favorite thing the league has implemented is the “sky judge”. It’s essentially a 9th referee who sits in the booth and has the power to stop play and look at something that the field judges might’ve missed, including penalties! I think that’s a terrific idea and one you’ll probably see implemented very quickly in the NFL. At the same time, the San Antonio Commanders were locking up the San Diego fleet as they battled their way to a 15-6 win. It was a defensive struggle (something we saw a lot of this opening weekend), and it produced the league’s first viral moment when Shaan Washington nailed Commanders’ QB Mike Bervovici. One thing I would’ve done differently is have these games kick off at different times. The Apollos game ended up being a runaway but you still didn’t want to turn it off because you might’ve missed Spurrier doing something fun. With only 4 games and no competing football to deal with, I would’ve slotted one game at 5 eastern and one at 8 eastern. Gamblers would’ve loved the opportunity to focus on both games equally; trust me. Other than that, I thought this was about as impressive of a debut evening as you could’ve had. Sunday’s games started off in Birmingham, Alabama as the Birmingham Iron made their debut. I actually got to attend and cover this game and I was blown away by the experience. I wasn’t sure how Birmingham would react to another attempt at a non-NFL professional team but for week one I thought the crowd was electric. I got there about 2:30or so and there was already a good crowd. They were handing out free shirts to the first 20,000 fans which was a nice touch for the first game. I made my way up to the press box where there was a large gathering of media covering this inaugural event. For kickoff, I went and met my wife and some friends in the stands to check out the fan atmosphere. I was really surprised at how energetic the fans were for this start-up. I talked to some of the fans about their experiences and they were very excited for the league and thought it was a great opportunity. As local fan Blake Simmons put it, “Auburn and Alabama fans uniting to root on a local team could be dangerous”. All in all, the fans really got after it. I thought there’d be a lot of folks there just hanging out because there was nothing else going on, but for the most part everyone there was actively rooting on the Iron. As for the game itself, the Iron pitched the first shutout in AAF history winning 26-0, prompting local fan Anthony Phillips to dub the Birmingham Defense as "The Iron Curtain". Former Alabama running back Trent Richardson had two touchdowns, and much to Alabama fans’ surprise, the Iron has a kicker in Nick Novak who went 4-4 on field goals for the day. The local fans stayed throughout the game. I was on the field for Richardson’s 2nd TD of the game and the roar was still loud. I’d say 75% of the crowd was still there despite the game being well in hand at that point. One thing I did notice was that people didn’t exactly abide by their ticket number. Most people just grabbed a seat once they got in in an empty row or section. I think this provides a great idea for upcoming games. I would make almost all of the tickets general admission and treat it like a student section where most seats are first come first serve. I’d obviously reserve a lot in the 50 yard line area for season ticket holders, etc., but I think the general admission idea would provide even more fan support. The final game of the weekend had the Arizona Hotshots defeating the Salt Lake City Stallions 38-22. The Hotshots were the pre-season favorites and they looked the part on Sunday night. Experienced NFL guy Phil Savage is the GM and Rick Neuheisel is the head coach. I’d say after the weekend they might have some company in the favorites category after Orlando’s impressive debut. Obviously since this is Deep Fried Bets, we have to talk about the gambling side of things. All four home teams were favorites and all four covered the spread. The Apollos were the biggest favorites at -7 and covered with ease. Three of the four unders hit, with the Hotshots and Stallions being the lone game that went over the total (52) as the two teams combined for 60 points. I think it’s safe to say that moving forward the offenses will catch up to the defenses and you’ll have a more balanced scoring margin. There should be plenty of good opportunities to fade overreactions this weekend, and we’ll obviously keep you posted on those. All in all, I thought it was a tremendous opening weekend for the AAF. The ratings were really strong, evidenced by the fact that Saturday night’s primetime game on CBS out-rated the NBA on ABC’s primetime match-up. There were several drops and lots of first week jitters but I think that’s something that will correct itself going forward. Week two starts on Saturday afternoon at the Ole Gray Lady as The Iron host the Salt Lake City Stallions at 1pm central; we’ll be there and I’m sure as hell looking forward to it! Keep checking in with us for all of your AAF Updates and be sure to follow us on Twitter @deepfriedbets for up to the minute information.